1. Much has been made of the recent fall in international students to the UK from India. David Cameron has just returned from India after banging the drum for British Universities and encouraging genuine students to study here. This is entirely compatible with effective immigration controls. 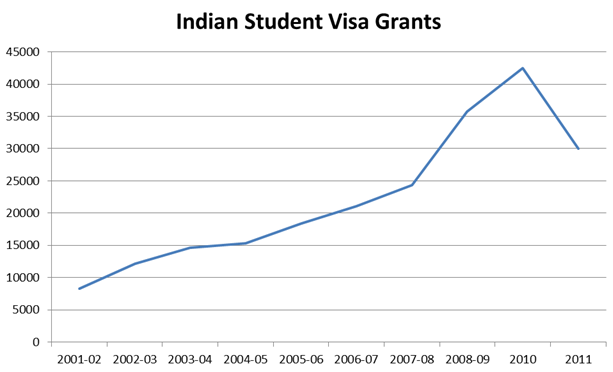 Indian student visa grants have fallen because recent abuse of the system has been addressed. 2. There are two ways of measuring student flows – visa grants and the International Passenger Survey (IPS). Both measures demonstrate that students have increased dramatically in the recent past. 3. 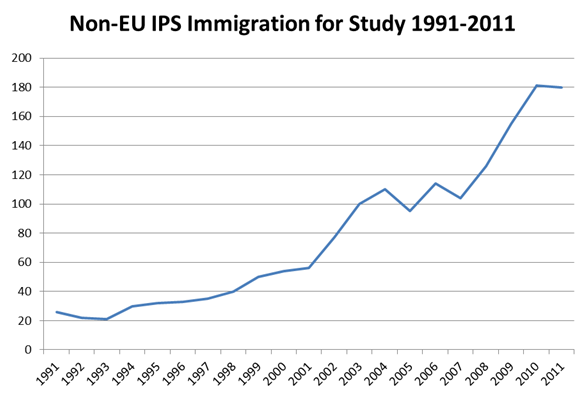 The significant rise in student immigration after 2008 is also borne out in the visa statistics. 4. In 2008 the then Labour government introduced the Points Based System (PBS) which was intended to rely on objective evidence rather than subjective judgements. However, it was largely a paper based system with no interviews or contact with an Entry Clearance Officer. Following its introduction student applications increased significantly. In some parts of South Asia student applications had to be temporarily suspended amid fears that the dramatic rise in applications was in part fuelled by bogus applications. 5. 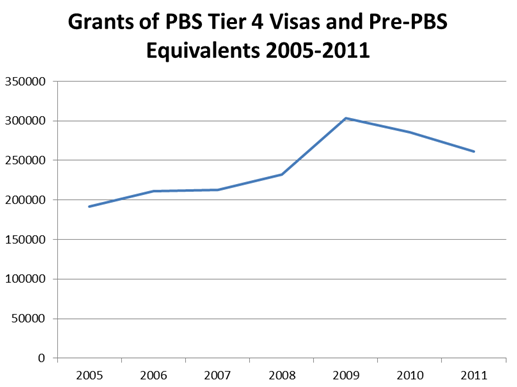 The graph above shows the sharp rise in student visas granted to applicants from India following the introduction of the Points Based System in 2008. 7. In 2012 the Home Office carried out a pilot scheme in which students were interviews at certain posts. The results suggested that large numbers of students who were granted visas would have failed an interview in which credibility was assessed. The pilot found that 59% of those interviewed would potentially be refused on credibility grounds, suggesting that abuse of this route in India is significant. 8. The evidence suggests, therefore, that the recent fall in Indian student visa grants is a result of the government’s crackdown on bogus colleges and bogus students. It is not a result of the ‘mixed messages’ being picked up in India in the wake of the on-going immigration debate in the UK. Bogus students are costly to the economy in that they use public services often without paying tax. They undermine the rule of law, compete for jobs with locals and enable unscrupulous employers to compete unfairly with those who play by the rules. Furthermore, tackling bogus students is essential if Britain’s higher education sector is to retain its world class reputation. 9. It has been claimed by Gavin Barwell MP that the recent fall in students from India will cost the UK economy £169 million and will result in lower growth and fewer jobs. It seems that the calculation has been arrived at by multiplying the fall in Indian students by just under £20,000 per year in tuition and other spending. However, this assumes that these students are genuine, when in fact they are bogus. Apart from any element of the first year’s fees paid in advance, there has been no loss of revenue to the UK economy. Even this will be counterbalanced by their use of public services. 10. In the context of Indian visa grants, it is clear that the recent reduction is a result of the British government cracking down on significant abuse of the route. David Cameron’s message in India was the right one – genuine students are free to come to study in the UK and can stay on and work if they are able to find a graduate level job. Moreover, there is no cap on the numbers. This message is entirely compatible with a strong, selective and well-managed immigration system. What is not compatible is tens of thousands of bogus students using the student route as a back door to stay in Britain. ONS, LTIM, International Passenger Survey, Table 3, Citizenship by Main Reason for Migration. Home Office Visa Statistics, Table be.06.s: Entry Clearance visas issued by category and country of nationality.